Learn all about our newest course, which provides a comprehensive introduction to working with base graphics in R.
We just launched Data Visualization in R taught by Ronald Pearson! R supports four different graphics systems: base graphics, grid graphics, lattice graphics, and ggplot2. Base graphics is the default graphics system in R, the easiest of the four systems to learn to use and provides a wide variety of useful tools, especially for exploratory graphics where we wish to learn what is in an unfamiliar dataset. This course provides a comprehensive introduction to working with base graphics in R. Ready to get started? 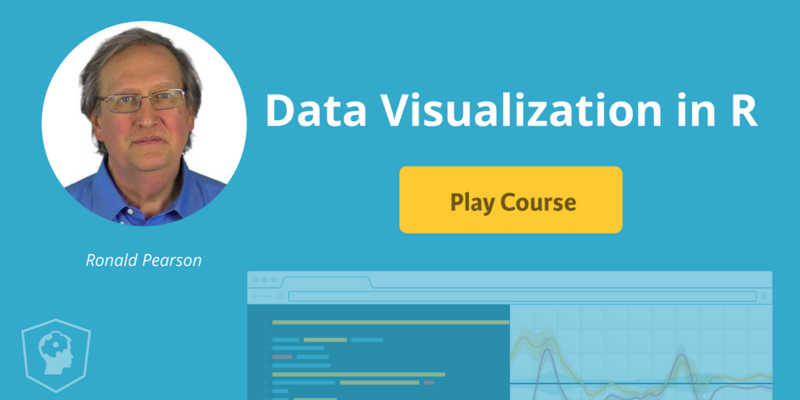 Data Visualization in R features 60 interactive exercises that combine high-quality video, in-browser coding, and gamification for an effective learning experience that will make you a base graphics master! In the first chapter, Ronald gives a brief overview of some of the things you can do with base graphics in R. This graphics system is one of four available in R and it forms the basis for this course because it is both the easiest to learn and extremely useful both in preparing exploratory data visualizations to help you see what's in a dataset and in preparing explanatory data visualizations to help others see what we have found. [Start First Chapter For Free] The next chapter introduces several plot types supported by base R graphics. We start with simple tools like histograms and density plots for characterizing one variable at a time, move on to scatter plots and other useful tools for showing how two variables relate, and finally introduce some tools for visualizing more complex relationships in our dataset. The third chapter focuses on adding details to your plots. You will learn how to modify point shapes and sizes, line types and widths, add points and lines to plots, add explanatory text and generate multiple plot arrays. The next chapter focuses on how to manage visual complexity so the results remain useful to ourselves and to others. Lastly, the final chapter introduces you to advanced plot customization and more! Ready to begin?